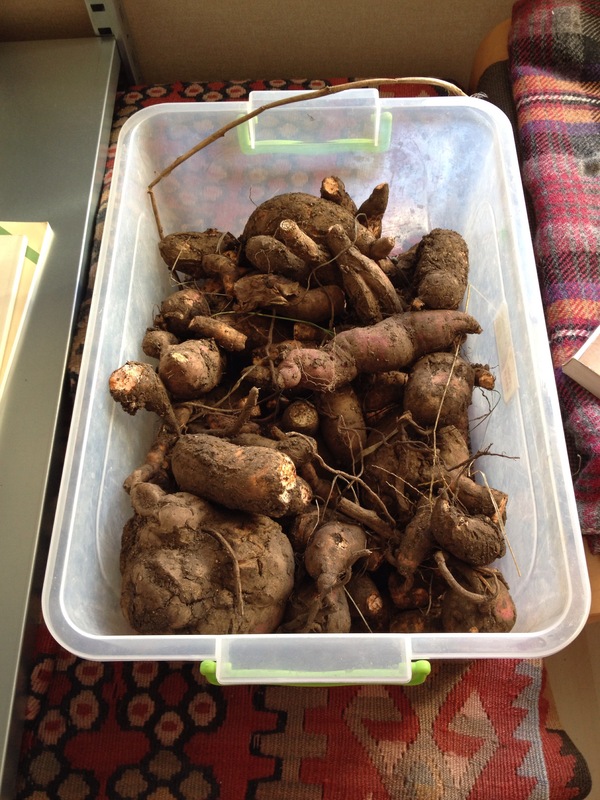 We had two beds of sweet potatoes this year, with four different varieties – two white and two orange. This is one of those things I grow because I love them and they are hard to find here (and expensive when I do), which puts them in the same category as things like Chinese veg and asparagus. My mother very kindly brought over some sweet potato plants for us, as I didn’t have any sweet potatoes to sprout – it’s been a few years since the last time we grew them. We had eaten the leaves while the plants were growing, which my mom really enjoyed but she was going to be leaving before we lifted the potatoes themselves. We dug up a little sweet potato for her to try. I left it on the counter for a few days, but when we ate it I was pretty underwhelmed. There was a lovely earthy flavor to it, but it just wasn’t very sweet. Then I ran across this article from Mother Earth News. I may be the last person in the world to learn about this, but in case I’m not let me just say that the difference was huge. Apparently, my sweet potatoes needed time in a warm spot for their sugars to fully develop. I didn’t follow the directions to the letter – I just put the sweet potatoes in a warm room that gets some afternoon sun and shut the door to keep the heat in. When I tried baking a little specimen after a few days, it was like eating a marshmallow, only ten times tastier. No joke. You discovered it the exact same time I did! I was wondering why the sweet potatoes I got from a local farmer weren’t sweet…then I saw the same article! A marshmallow like sweet potato? Awesome! I had read that they needed curing, but had no idea that the process brought about their lovely sweet flavor! Thank you for sharing this! It was a revelation (and a relief!) to me. That is AWESOME! Who would have known??? Now I know what to do with sweet potatoes that are sometimes kind of tasteless . . . Thanks, Siobhan! Btw, been lucky to have been able to spend some time with your awesome mom while she is in town. Really wish you were here too! Me too — you guys are getting up to all kinds of neat stuff over there. Flying Pig Bacon?? Waiting for Godot?? Where’s my plane ticket, dammit! Need to try gorwing these next year! I think they do nicely in our hot dry summers, so they ought to be happy in your garden too! I wish I could find sweet potatoes in Mersin – and butternut pumpkin! Nom, nom, nom!!! Stupid non gardener question. Can you purchase seeds? You can grow butternut squash very easily from seed. Sweet potatoes are a little different – I have sprouted them before pretty successfully. You need to get a sweet potato to begin with, put it in water the way you would an avocado seed, and plants will sprout.